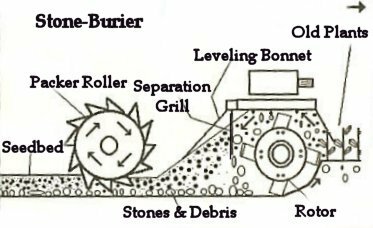 Stone-burier Options | Butler Equipment, Inc.
Here’s how it works: The reverse rotation blades cultivate the dirt, pulverizing clods and chopping all grass, weeds or stubble. The dirt, mixed with the chopped plant debris, is lifted by the blades and propelled backwards. The 12 mm steel rods of the separation grill screen out larger clods and rocks. 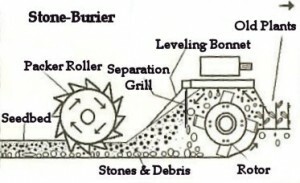 Heavier rocks and pebbles are deposited first, on the bottom of the trench, while the soil passes through the grill and covers the rocks and debris. Seeders are NOT drills–the seed fall onto the prepared seed-bed and are pressed into contact with the soil by the packer-roller. Just add rain for a perfect stand!